back again, from the old site, and slightly revised too...i will start updating pics over the next week or so. some have disappeared. theres a ton of threads about small things in general about this swap, so heres my attempt at a full, step-by-step instruction on how to do it starting with your ae86 GTS. theres going to be plenty of info links, pics, etc. if im missing something or youre unsure, ask away. step 1-buy yourself a 20v. either Silvertop(ST) or a Blacktop(BT) will do. you would be best off doing an overhaul to be sure gaskets and seals are in good working order(i will add part numbers at a later date for misc gaskets and seals, since some are cross-referenced to usdm cars). step 2-start a checklist, one for parts needed, one for work needed. Last edited by morgan on Tue May 21, 2013 9:17 am, edited 2 times in total. now is whan you want to freshen the motor up. while its out of the car, do your maintanance. new HG, valve seals, water pump gaskets, etc...now is when you want to get machine work done. disassemble everything if needed, always good to check stuff. an engine stand helps wonders. pick one up at Harbor Freight before you start for under $60. pays for itself after one use. 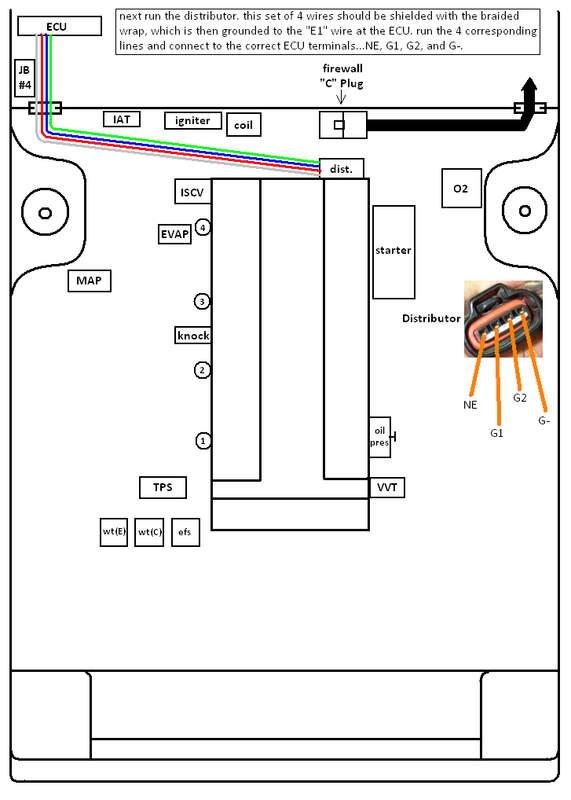 heres a link to the BT manual for reference on doing such work, proper torque sequence, etc, everything is in there...save this to your computer. only problem with the BT manual, the instructions for setting your cam gears and timing belt is off. heres a thread i started to show you how to set it up correctly. i recommend changing your timing belt at this point. if you have a BT, youre out of luck and need to source an oem one. have a ST? then go to your local parts store and order a Buick Skylark belt. wtf?! i know, but its true, im running one right now. 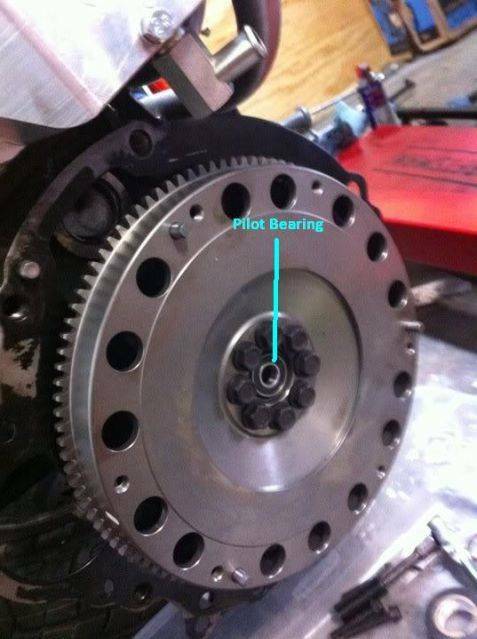 *dont forget to put in your pilot bearing, this is very important. go to toyota and get a new one. make sure you tap it in with a socket thats as big as the bearing! you dont want to put pressure on the small, inner race, of the ball bearing cover. only the outer race! Last edited by morgan on Tue May 21, 2013 9:19 am, edited 1 time in total. so theres 2 options on this...either keep the FWD flow and buy a water line kit, or change stuff around and go with a RWD flow. 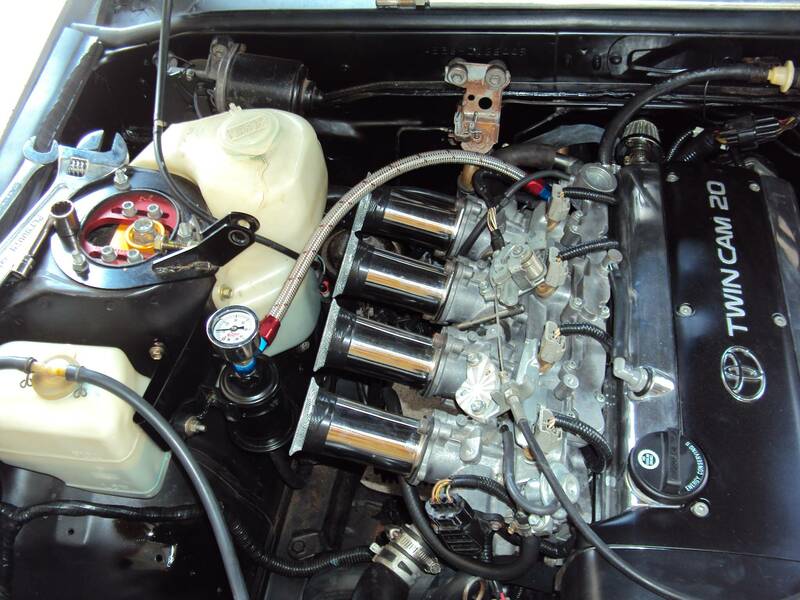 Its said that the FWD flow is better, the cold coolant from the radiator goes directly to the head and under teh ITBs intake first, whereas the RWD flow lets the cold coolant into teh water pump to the block first. The gains/looses are debatable, and each is "better" in its own respect, but in the end...it comes down to what you decide you want. Money plays a factor along with the purpose of the build and also if you do/dont want hard liines all over your bay. Priorities change between people, so im not saying to do either, you decide. This is the option where you keep everything flowing like it was from the factory. although it sometimes means shelling out big bucks for the water line kits and moving things like your ISCV and other stuff. When done correctly, it looks clean, but you still have hardlines going all over the bay. You end up keeping the stock 20v water pump, exhaust side outlet, and the thermostat housing at the back of the head with all the stock sensors(or use the housing provided with the kit). heres a link to the explanation of how the flow goes from the factory, along with a few other options. so you have a few aftermarket hardline kit options. T3 makes great products, and their customer service is par to none. you get to support real 86 enthusiasts, buy american made products/support the economy, and you wont have to wait months for the parts...usually. simple and straight forward. need to relocate the ISCV, with the included bracket. this kit is legit.m if i had the cash, this is what i would be using. great reviews from everyone that gets it. if you have access to mills and machining knowledge, build your own. 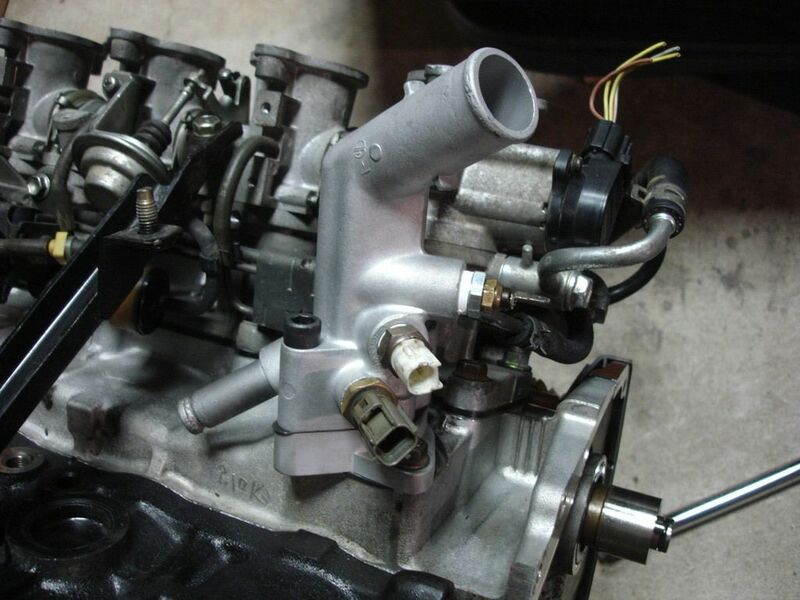 you can also use the stock thermostat housing and ports, and run lines to the proper ports on the ae86 radiator, and go from there. 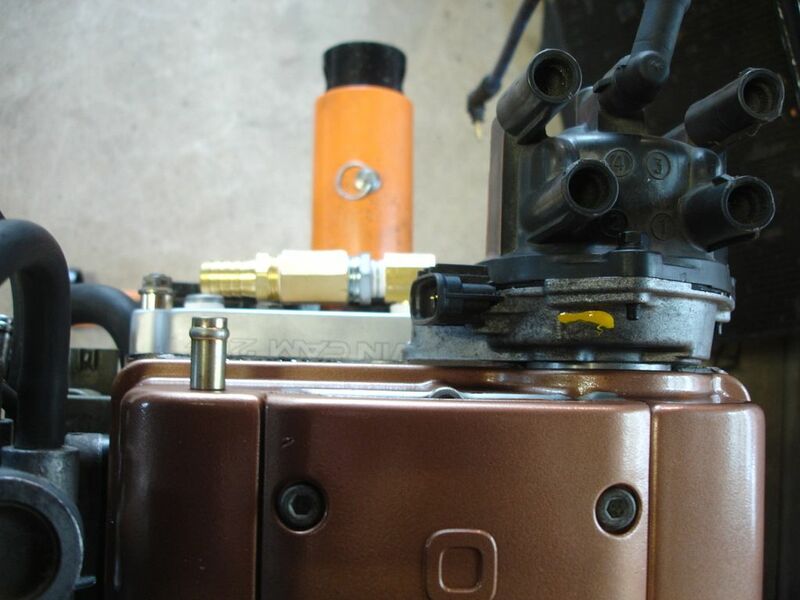 you need a 16v water pump and backing plate, and to mod the upper water neck from the 20v that is right above the water pump. 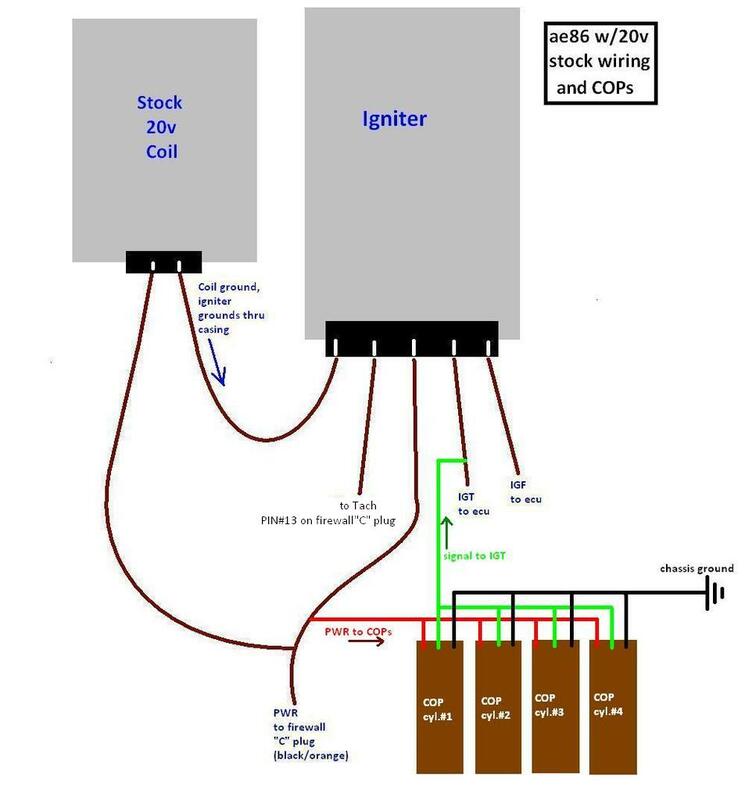 the flow will be different than the 20v had from the factory, with the cold coolant entering the water pump, then to the block first, unlike the 20v which it went to the head first. 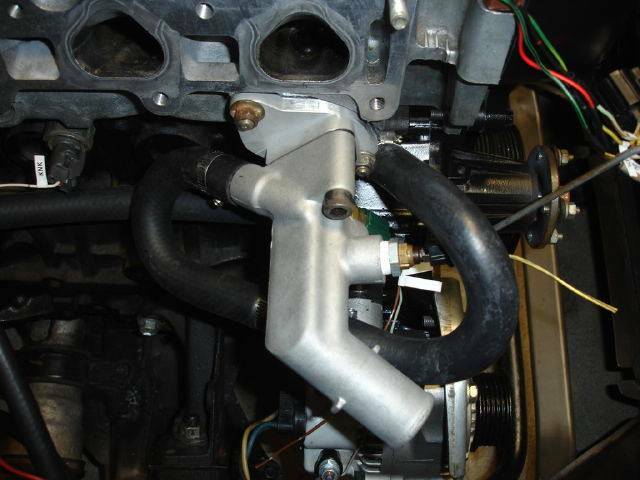 This rwd flow is said to cause cylinder #4 to overheat. While i didn't have a problem with it, i also haven't tracked my car yet. I would recommend a lower temp thermostat, 5 to 10 degrees lower. heres a pic of how the stock 86 rwd coolant flows. good products, many options to get exactly what you want. heres a link to his thread on c4ag to his website. very knowledgable guy, and willing to help explain your options. simple and effective. only problem i foresee with this is sensor location. going stand-alone? might not be such an issue then. not perfect but functioning and proven to work. these are one-off pieces, im not in production, so sorry, dont ask please. i used my 16v water pump, made a by-pass plate for the rear of the head with a port for the heater, an exhaust side block off plate, and an adapter to mount the stock 16v upper water neck to the 20v head to utilize the 20v sensors. 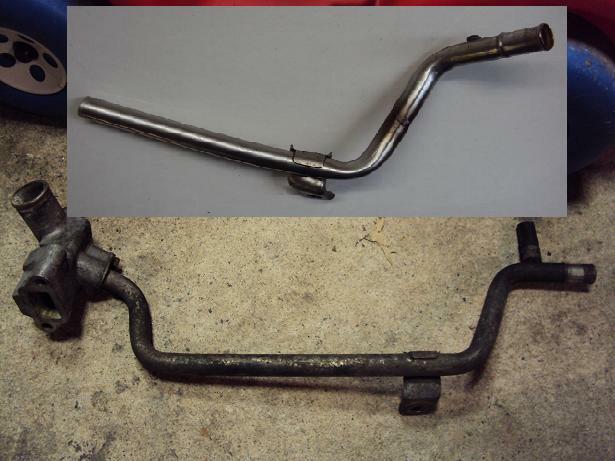 bottom pic is mr2 line, top is after cut and weld. heres how the upper water neck sits, just needed to find another hose that fit better since the port angles down a bit more. Last edited by morgan on Tue May 21, 2013 9:29 am, edited 1 time in total. theres a few options for this, i will go over 3.
not always the choice option, but effective and cheapest. With the 20v dist. being at the back of the head, when orientated for a rwd car, the cap sticks out too far. you need the firewall in that area to be moved back about 2". easiest way a BFH, but it looks like sh!t. heres a pic of my 86 when i got it. the po had a 20v in it, and went to town on the car. even after some paint, i still couldnt stand this. didnt help that i had a 16v and a broken air box to change the vents for the fan. when i finally did the 20v swap, it "helped"...me be lazy. i just covered it with some dynamat type material to keep the exhaust fumes out. didnt work though, and still looked like sh!t. but at the end of the day, the dist. fit. only problem i had...getting it out if needed. i had to take the valve cover off, unbolt the cap holding the dist in place on the head, and unplug the wires. if that wasnt enough in such a small space, you then have to wiggle the dist. out and find the sweet spot. basically try every angle til you get it out, and repeat for installation. a real PITA. you can find yourself one of these kits, but be prepared to pay upwards of $700 new. heres what they look like installed. 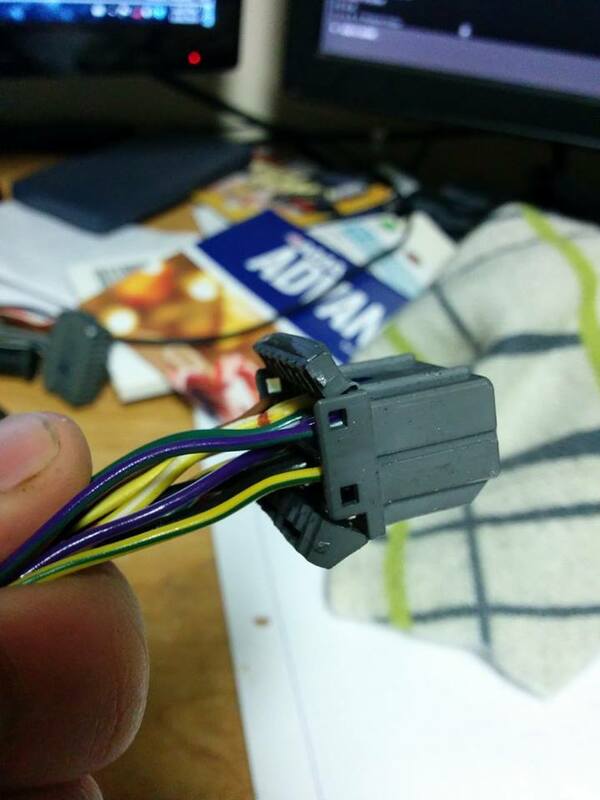 only thing with these kits, you need to get different plug wires, since the stock ones arent long enough. i believe Sam_Q also makes his own kit, or its in the works. while utilizing the stock coil for a tach signal, the stock igniter for the confirmation signal to the ecu, and a waste spark that works...this keeps you from shelling out $ for the relocation kit and you dont need to take the BFH to your car. pretty simple and straight forward. heres a thread about all the different coils you can use and how to wire them. cleaner, and functional. some people have problems with the rpm's being limited to 4000 with the COP conversion, but it usually has to do with incorrect wiring. there isnt really much to this. you need your stock gts in-tank fuel pump to be operational, and you might as well buy a new filter too. 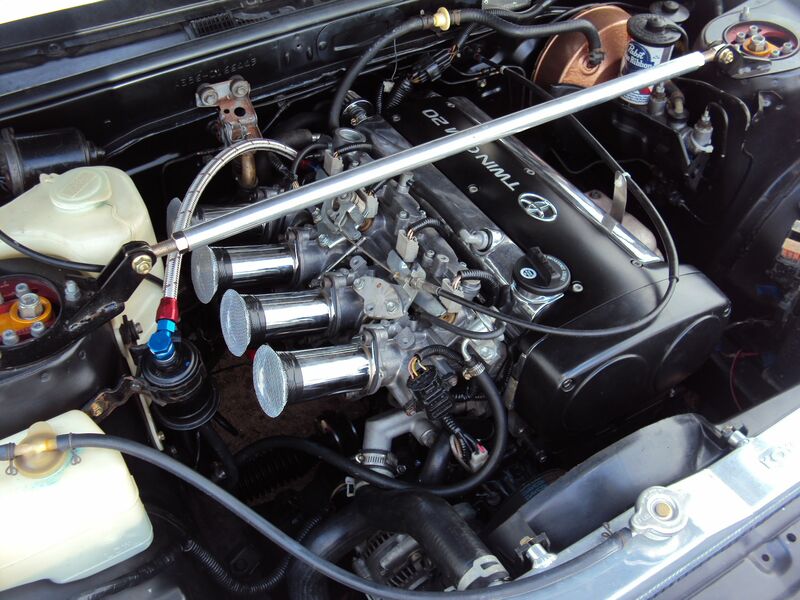 the stock ae86 feed line to the manifold isnt long enough, neither is teh stock 20v line. so you can either cut them and add in a piece to lengthen it, or go with stainless braided lines. i read this thread below about it, seemed pretty easy. So i ordered up the materials from http://www.anplumbing.com and did it. the fittings i got, 2 banjo bolts, makes it tough to get the line to go just right when the filter is in the stock location. 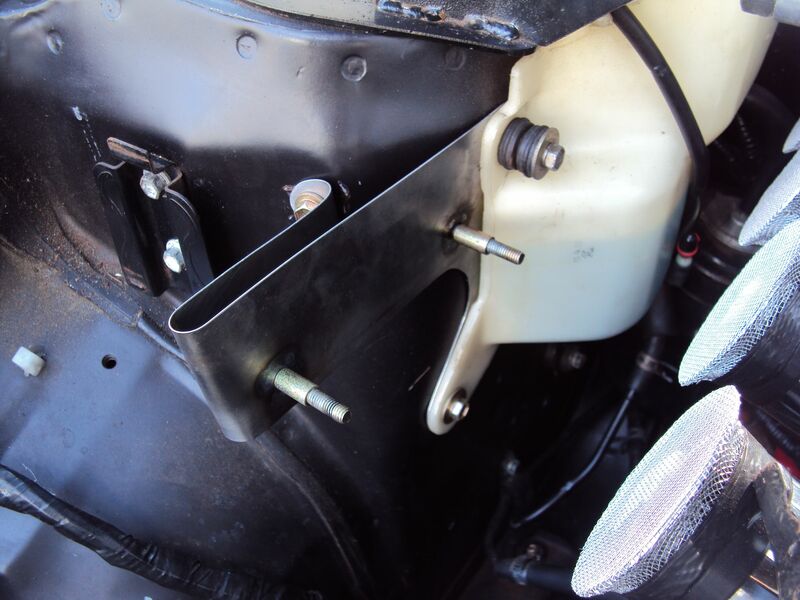 then i ended up snapping a banjo bolt in half from over-tightening it, so i got some other parts and made a bracket to locate the filter higher up on the passenger side shock tower. just get crative, but be safe. it is gasoline afterall so lets try not to light our car on fire from a half-assed job. this is where quality really counts. this can be the most overwhelming part of the build, if your a DIY'er like me. 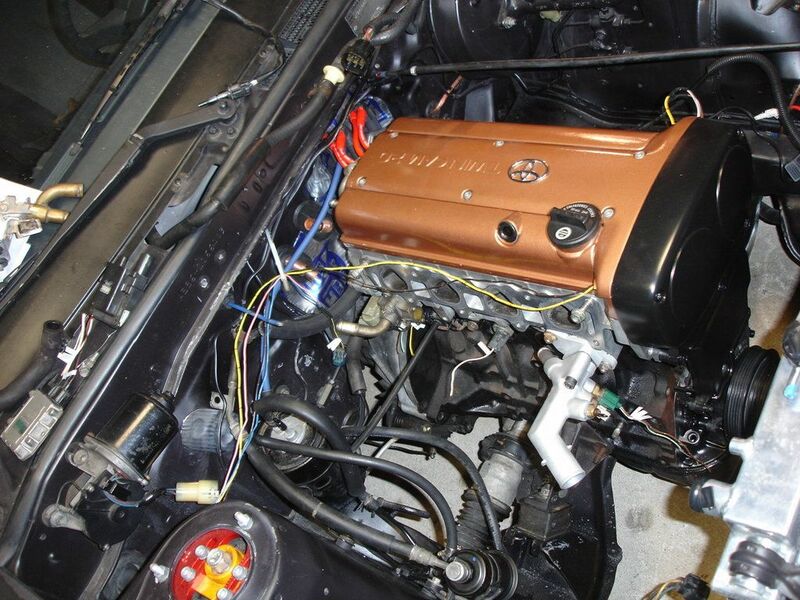 many just send the 20v engine harness and the 16v engine harness off to be done by a pro, at the cost of $350-700. Im not a pro, but i have experience and its proven since my car runs, and will do it if you need me to. PM me if your interested. you have 2 options for that route. 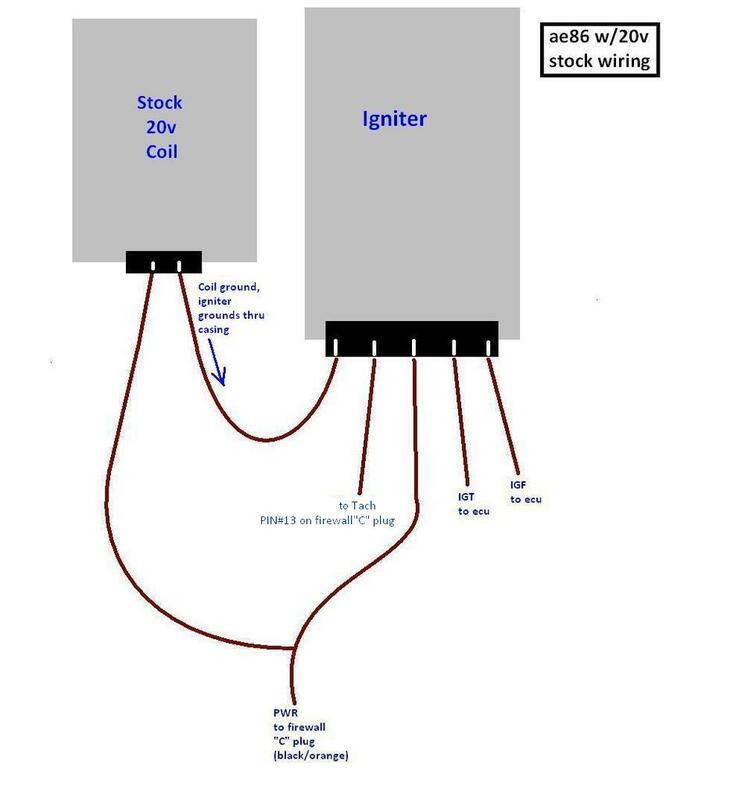 Dr Tweak of Pheonix Tuning or mr220v. 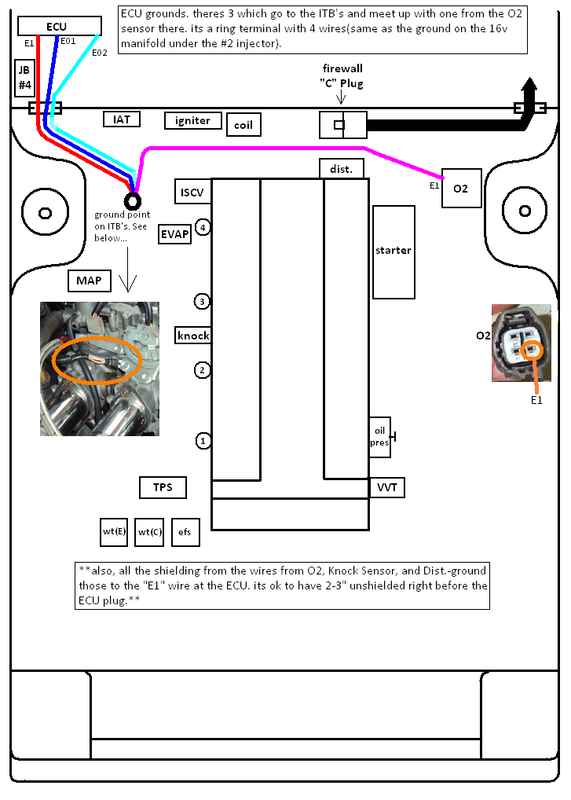 now if your thorough with your work, have good research skills, soldering skills, wire diagram knowledge, lots of free time, and a desire to do this yourself, heres a simple walk through. but be warned! its not easy, if you feel that it might be too much, dont do it, you will cause more damage, and spend more money in the long run. but lucky you, you dont have to go searching all over for the info, heres my collection of stuff that made it possible for me to do it. You will greatly benefit from owning an FSM for your car. 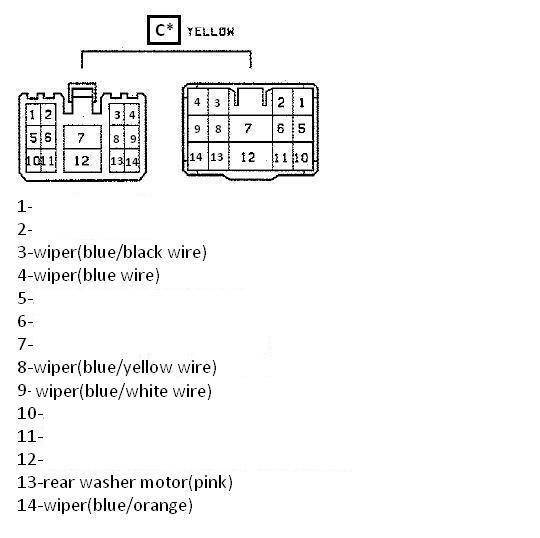 the Haynes manual also has the wiring diagrams too if you cant get an FSM. all the 20v pigtails can be sourced at your local junkyard. 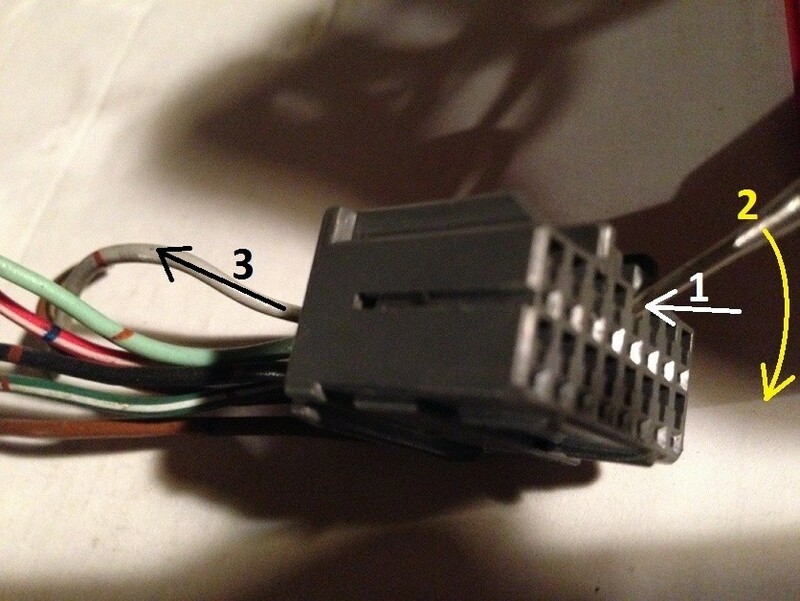 along with the MAP sensor from the 1993-97 corolla and the IAT sensor from any 90's toyota. the ECU plugs from the same corolla, other 90's toyotas and the same era hondas too. i brought parts with me, had them marked so they knew i wasnt stealing them and so i didnt pay for them again, and just matched them up. i cut about 6" off so theres something to work with. 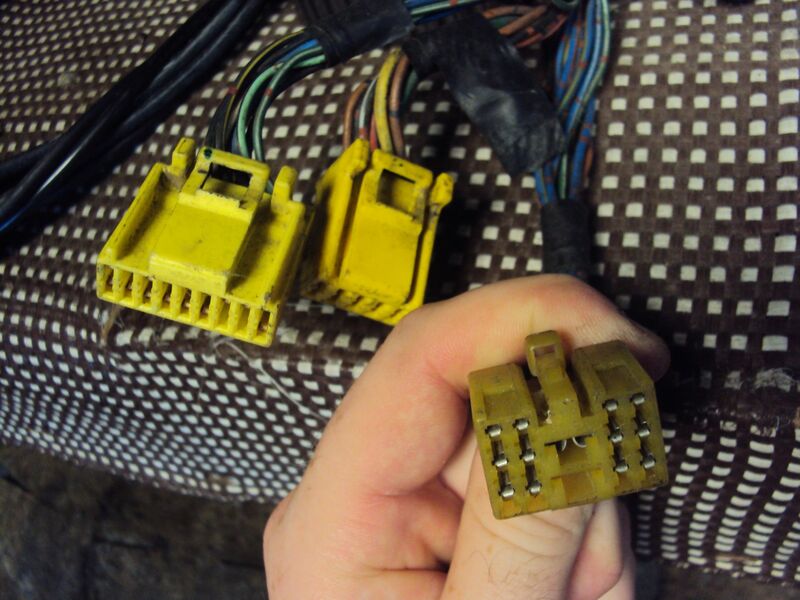 i also sugest if your building your own, to buy a sacraficial harness, i recommend the 1993-1997 corolla, since you can use a bunch of its pigtails, the MAP sensor and the IAT sensor, along with the ecu plugs. 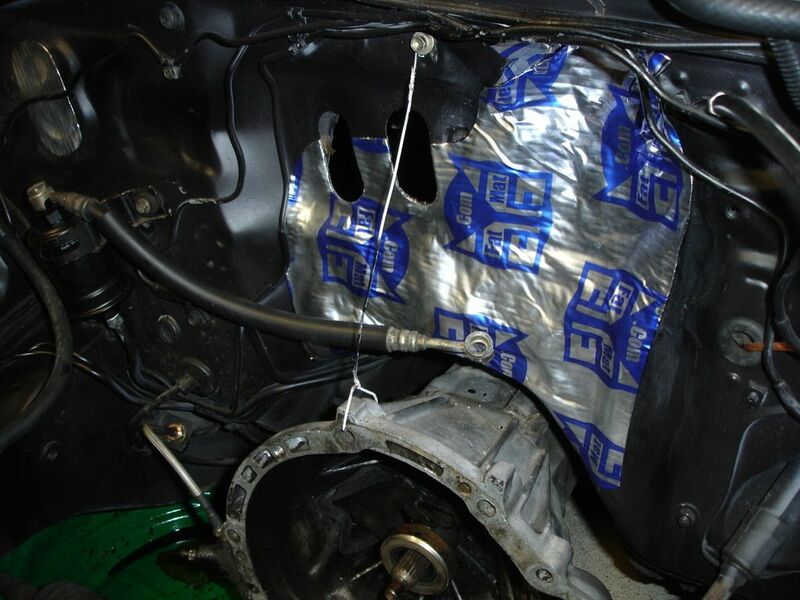 this site is a guys diary of a swap in his aw11 mr2. really good info and pics. 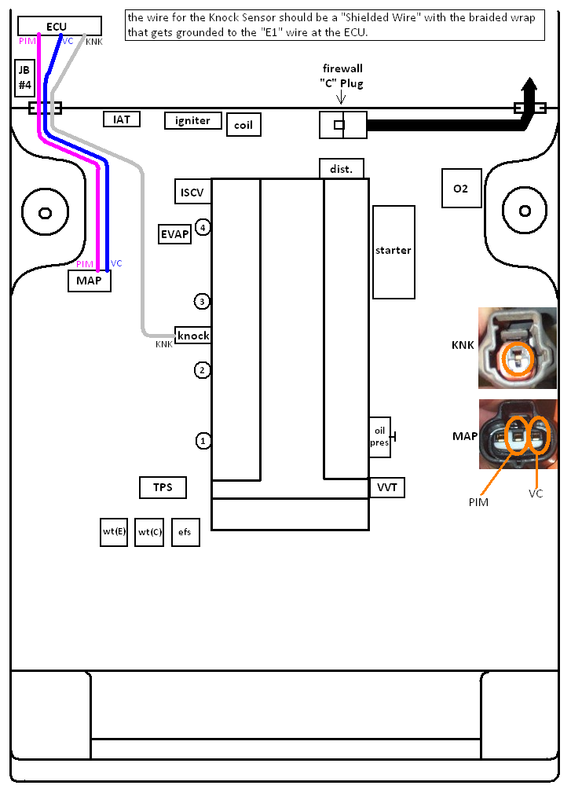 Silvertop wiring diagram. similar to the BT, but consider the difference from AFM and MAP. still good in seeing how things are done up. i printed this out huge, taped all the pages together, and put it on the wall of my garage. 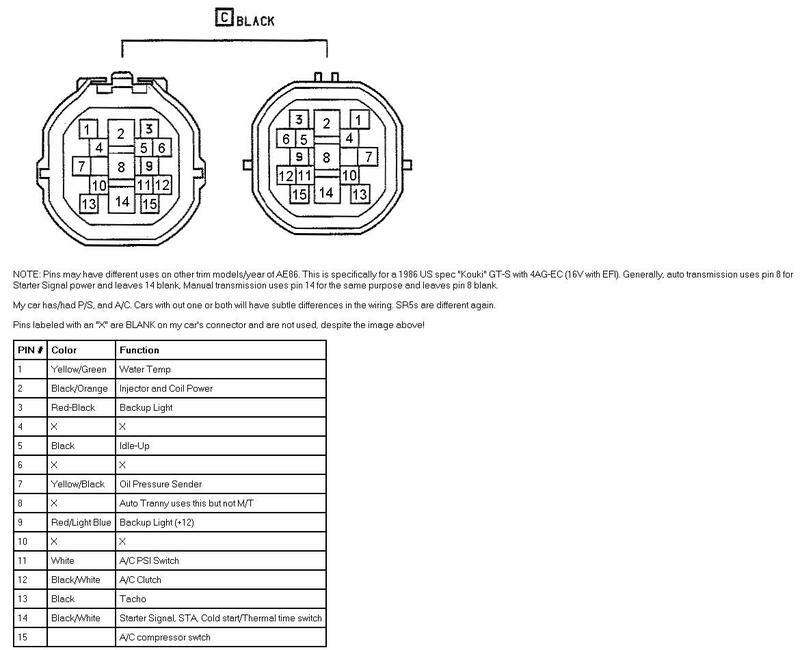 a full list of what each wire does. for an ST, but only difference from a BT is the AFM/MAP. really helpful...download it and save this! read the REFERENCE section of club4ag. tons of info and pics to save and print out. 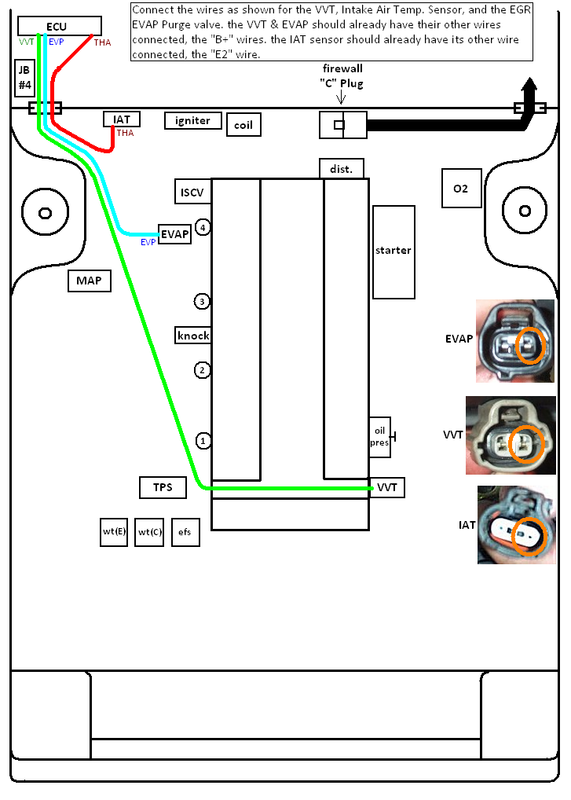 heres an overview of how i routed the wireing harness when it was all done. 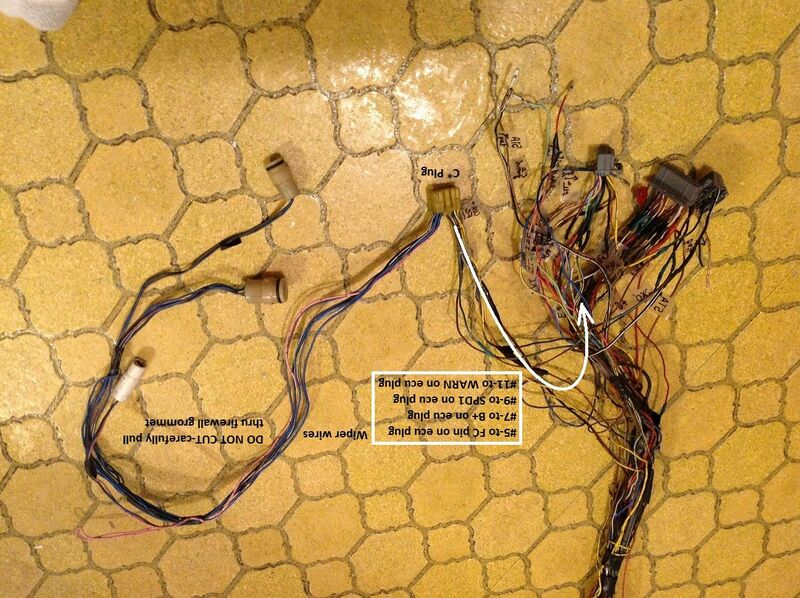 to do your own wiring, you need a few pigtails from your stock harness. 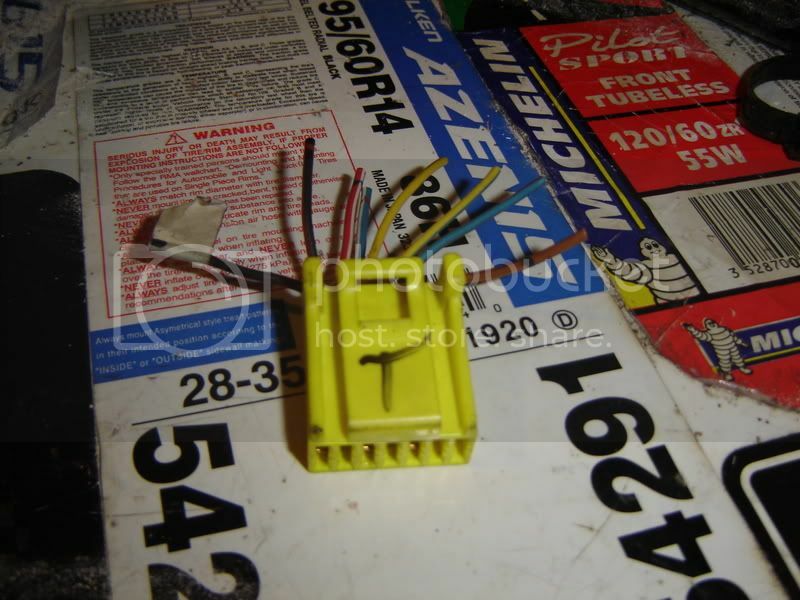 from the underdash harness, you need this plug which goes to the ECU, well call it the "T" PLug. 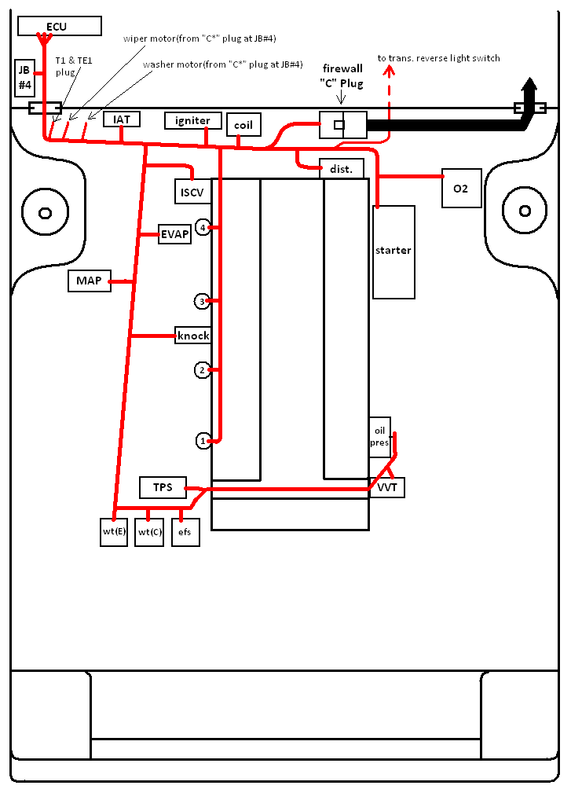 more so, you need to cut the plug off and re-run some wires to the 20v ECU. the B+, SP1, and WARN wires. 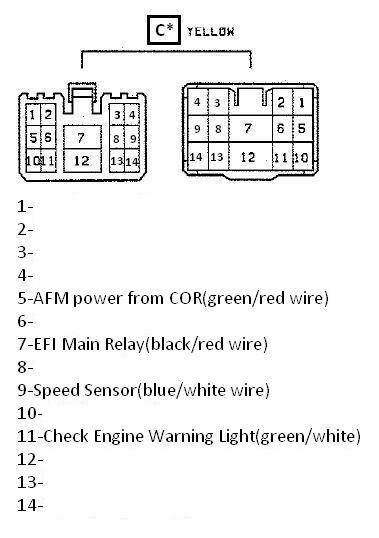 heres the locations, on the ECU, just imagine the plug in there and see which wires you need. and the "C*" plug, from the gts engine harness that plugs into Junction Box #4(JB#4) behind the passenger side kick panel. 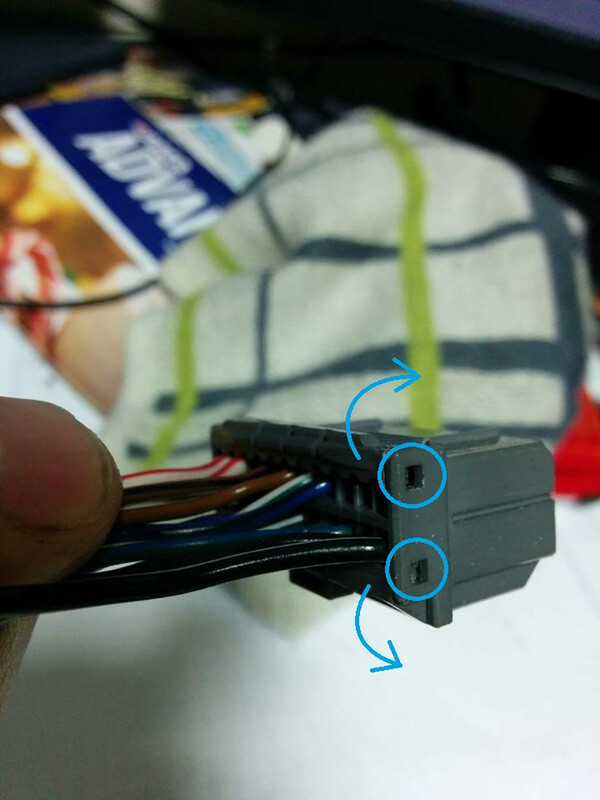 its the plug that im holding, you can see the difference between the other 2 for the ECU. what you want to do for this one is seperate the GTS harness and keep in tact the Wiper Motor and Washer Bottle Motor wires and pigtails and incorporate them into your 20v harness. you can cut the others, but dont cut the wiper/washer wires that are going directly to those 2 items, otherwise you get to solder those too, and why bother if its already complete. 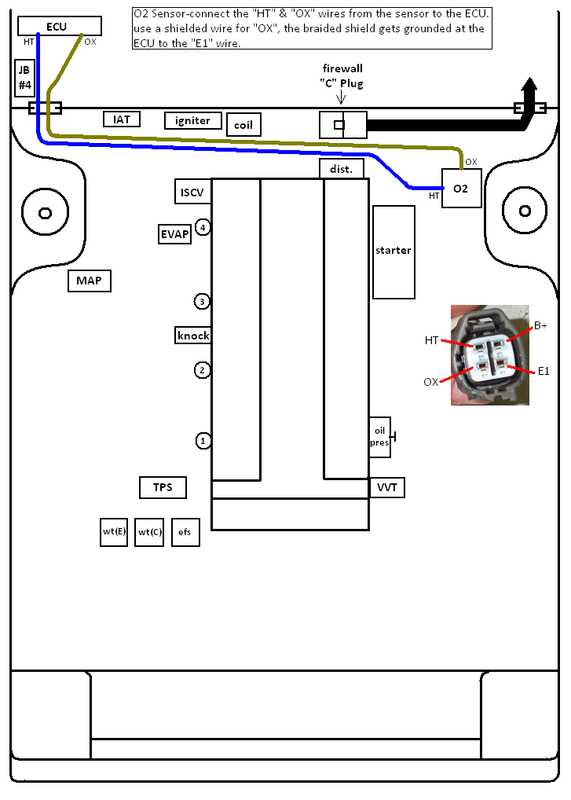 you also need to connect PIN#11(warning light)to the 20v ECU plug. the WARN or W(green/yellow) is the check engine light in the cluster. if you dont source a GTS cluster with this in it, wire up an LED or something. wire up the wipers by seperating the wires on the GTS harness and pulling them thru the firewall grommet, no need to cut them. 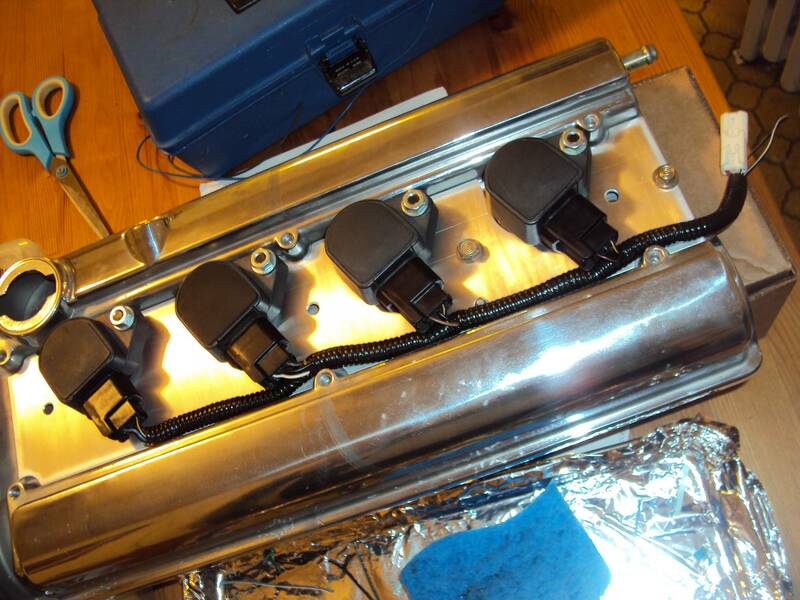 then the injectors, on the 20v ecu they are labeled "#1, #2, #3, and #4". connect each of those to the corresponding injector. the #1 injector is closest to the cam gears, the #4 being closest to the dist. side of the motor. you should have already wired the Power(B+) wires from the "C" plug on the firewall, so this is the last step with these. then the O2 sensor, the B+wire should already be done, so only the E1, HT, and OX wires left. you should use a shielded wire for the OX, this is like a braided metal netting that goes around the wire and keeps there from being any "interference" in the signal to the ECU. only thing is, you need to connect the shield to the E2 wire down by the ECU. if you bought a sacrificial harness, find out which wire is shielded and use that one. 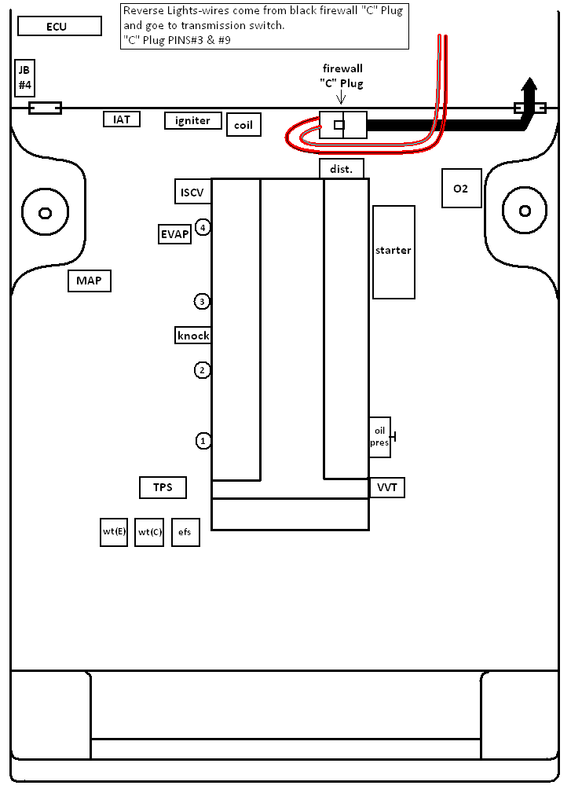 i will cover the "E1" wire later under "ecu grounds". next work on the Knock Sensor and the MAP sensor to finish them up. then finish up the the VVT solenoid, EVAP purge valve, and the Intake Air Temp. Sensor. then connect the ISCV and the TPS. the TPS has 4 pin-outs, but the Blacktop only utilizes 3, while the Silvertop uses all 4.
next is the ECU Water Temp Sensor"wt(E)", the Gage Cluster Water Temp Sensor"wt(C)", and the Oil Pressure Sensor wire. 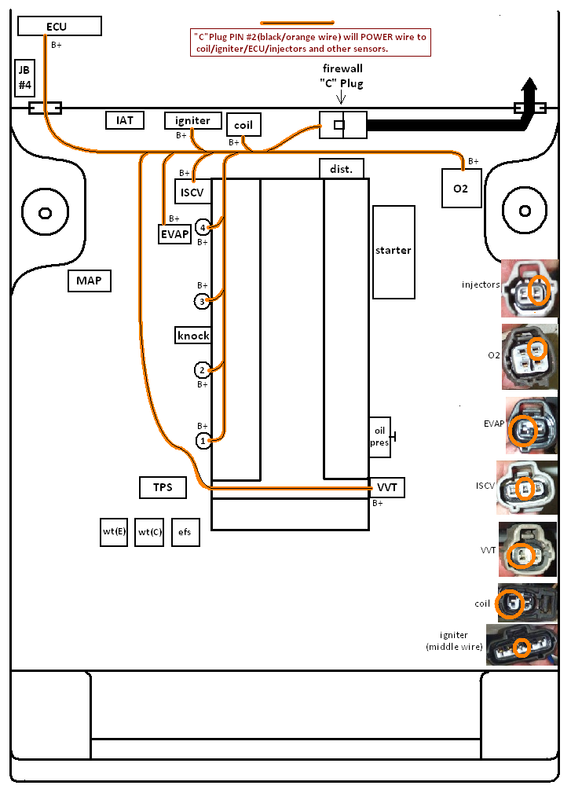 use the same wire from the 16v GTS harness if you want, just un-wrap the harness and pull it out so you dont have to solder it on the black firewall "C" Plug-PIN# 7. or just snip both ends and run a new wire. then there is the distributor. the 4 wires need to be shielded together with the braided wrap, then connect the shield to the "E1" wire at the ECU. i went to the junkyard and pulled apart a 1995 camry harness for this wire bundle, shielded and ready to go. it was about 8 inches too long so i shortened it. spent $10, and about 30 minutes of my times, and it came with the correct pigtail iirc. 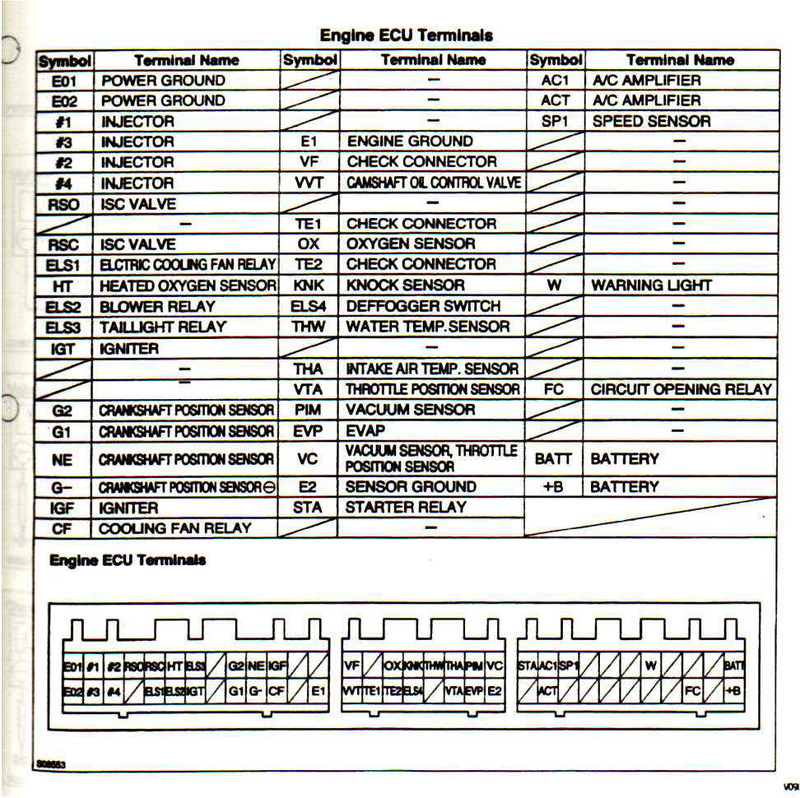 the starter power wire needs to be tapped into and ran to the ECU "STA" terminal, the "FC" terminal needs to be connected to the green/red wire of the COR, which can be accessed from the yellow "C*" Plug(pin#5) at the JB#4. and the "SP1" terminal at the same "C*" Plug too. chances are i mixed a thing up or 2, if you see something wrong, let me know and ill fix it. likewise if i left anything out. feel free to ask any questions, ill do my best to answer. Last edited by morgan on Wed May 22, 2013 9:29 am, edited 2 times in total. 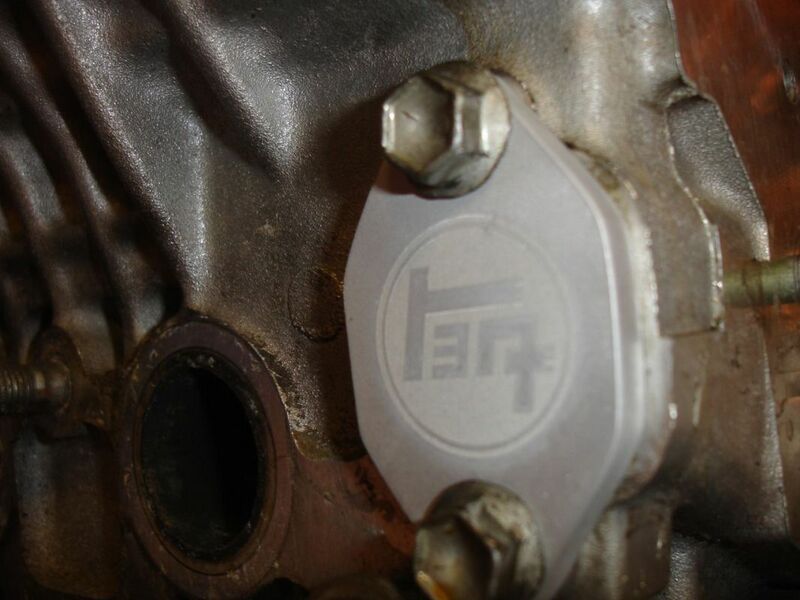 theres a pin in the block that needs to be removed, its on the intake side, at the bottom. sometimes they are really stuck in there, just drill a hole in the motor mount then, so you can mount it if you can pull it out. 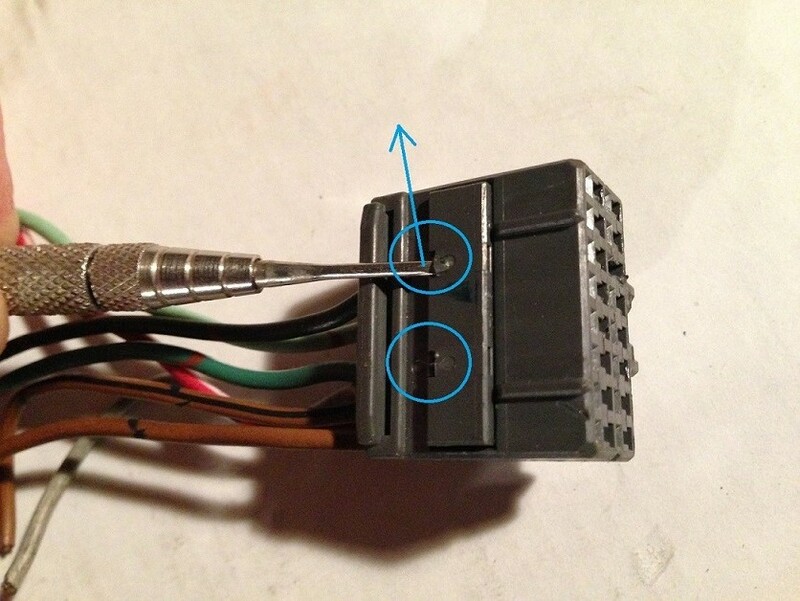 in the pic below, the pin is circled in red, and the bolt holes for the motor mount are highlighted in green. 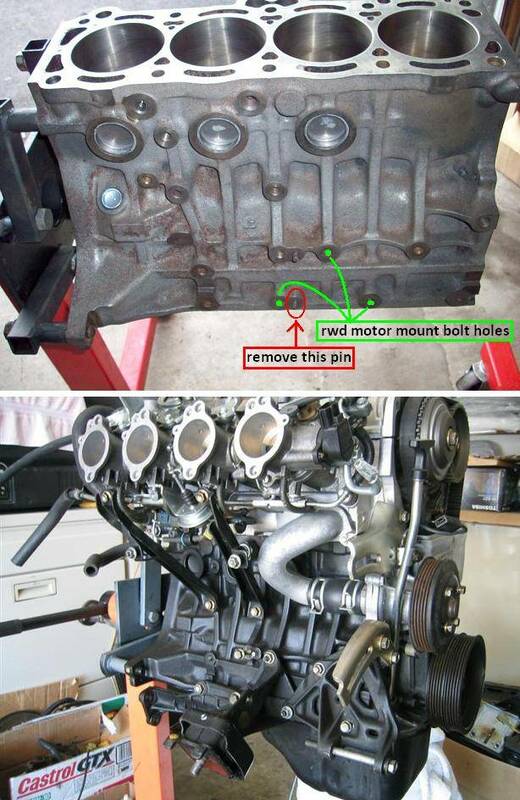 the bottom pic, from the 4age20v blogsome site, just shows you how the motor mount should look once on the block. not too difficult, here's some steps and tricks to doing it properly. 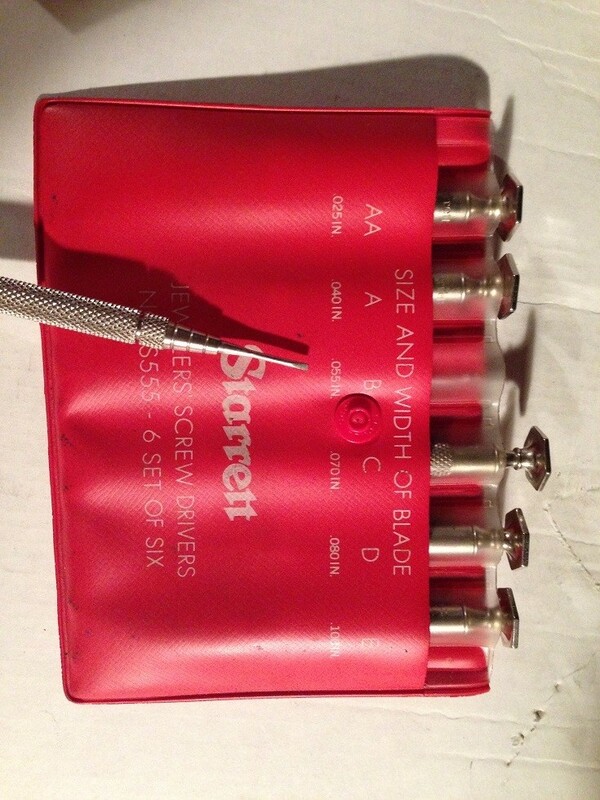 1-aquire a set of jewelers screwdrivers, you only really need on small flat head(size noted on case for the one I use. 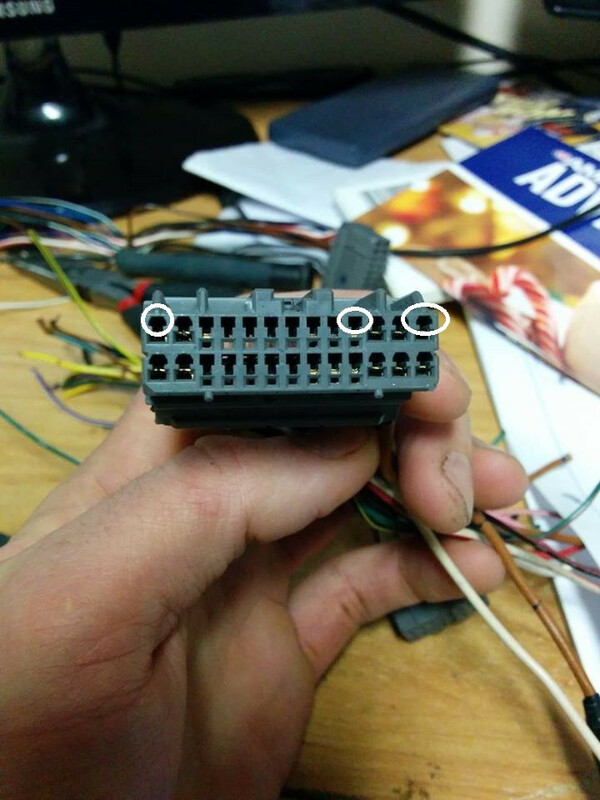 2-lets start with the ECU connectors, there's 2 types that I have seen. 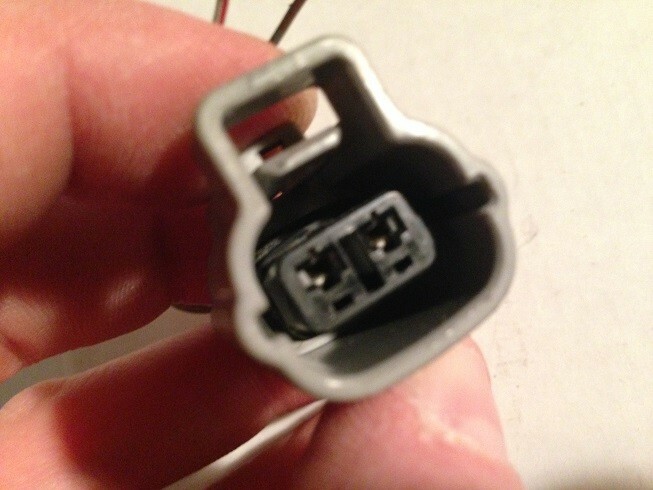 here's the 1st type with a separate retainer clip in the connector itself. use the small screw driver and insert it into the 2 slots circled in blue, then pull the retainer up so the wire & terminal can be removed. 5-now its time to remove the wire & terminals. the openings are on top of the terminals, seen in pic, circled. that where the locking pin is located that you need to move up to unlock terminal. 6-slide your flat head in the upper opening, sliding it along the top of the terminal till it stops(which should mean its up against the locking pin) then rotate the screw driver to move locking pin up as you pull wire out from the back. watch how the terminal is orientated once you pull it out, you should see a large opening on the top of it, that's where the locking pin is inserted to keep terminal in the connector. 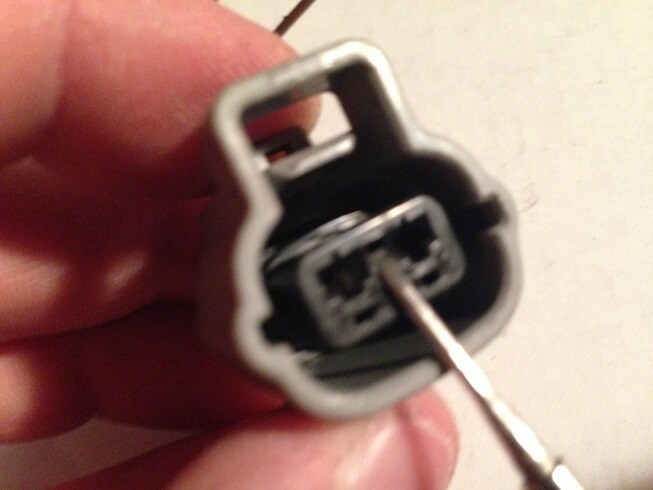 obviously, it needs to go back the same way, it won't go in any other way without force and damaging the connector. 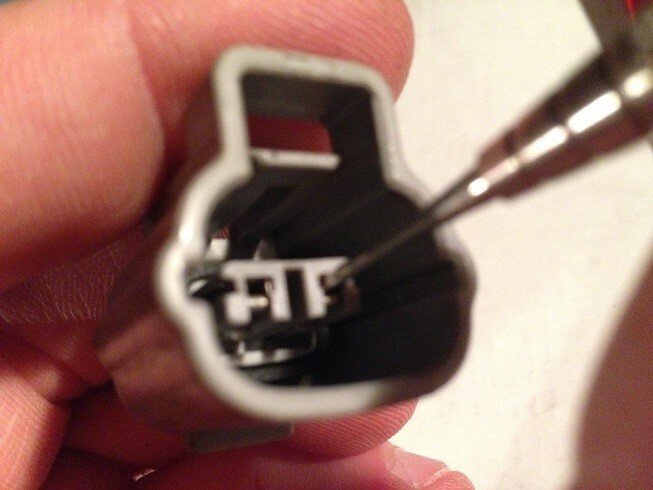 7-here's a larger connector, similar to one of the ECU connectors, release the retainer by prying it up prior to removing the wire & terminals in the same fashion. 8-these can prove a bit more difficult. 99% of the time there's an inner retainer. 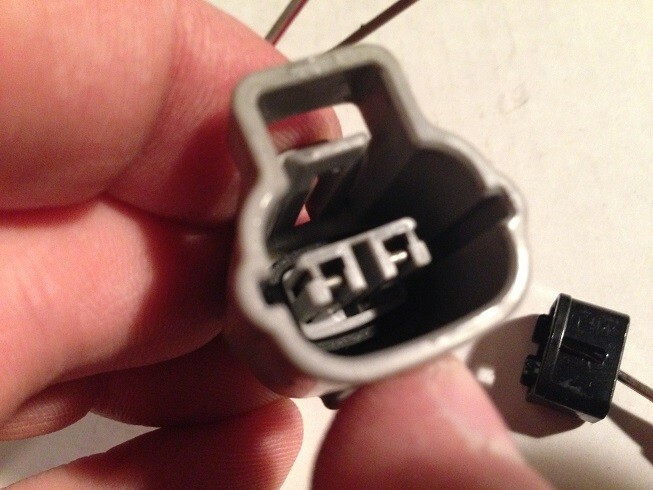 the connector is grey, while the retainer is black. 9-use the flat head and pry the retainer up and out of the connector. some are harder than others and some will break so you might need extras(generally the 20v ECu Water Temp. connector is the one I break...every time). 10-after you release the retainer, pull it out of the connector. 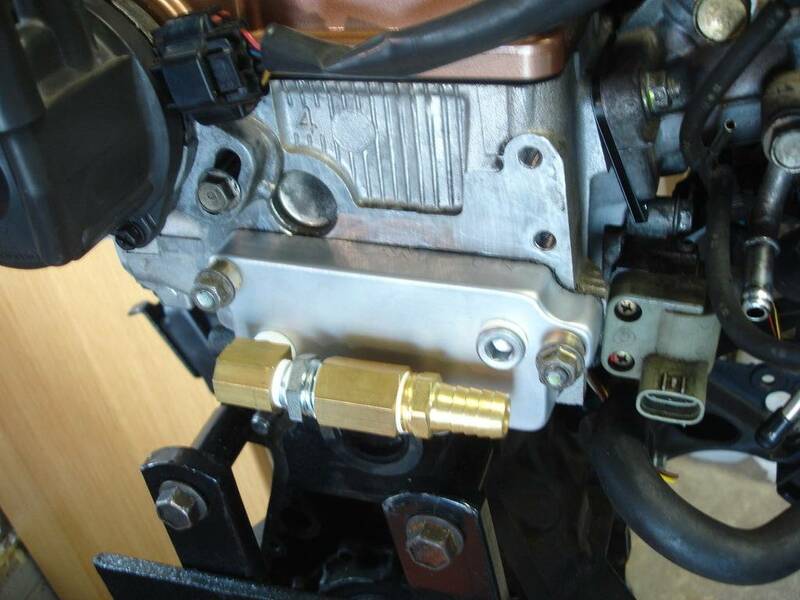 11-follow the same steps as the ECU connectors for releasing the locking pin and pulling the wire & terminals out. 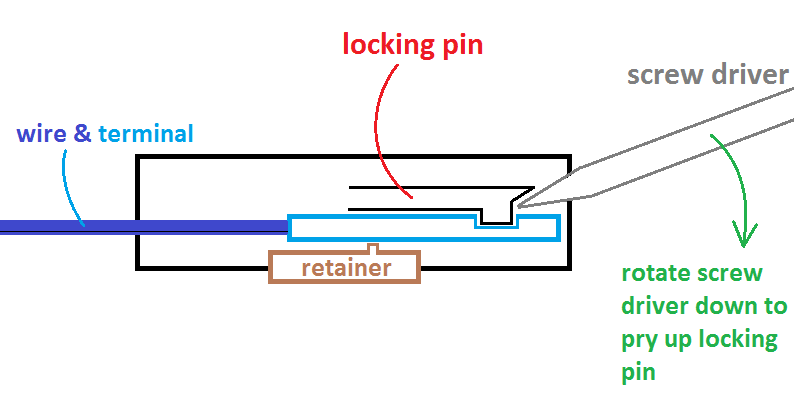 I made a little sketch so you can see what's going on inside the connector with the retainer and locking pins. Last edited by morgan on Thu Jan 16, 2014 10:15 am, edited 1 time in total. Do you have any information on hooking up power steering to a 20V? Would the pump and everything be a direct bolt on from the 16v? sorry, i dont know. i do have a friend working on that tho, ill pick his brain later. Wow great thread. The wiring stuff helps a ton. 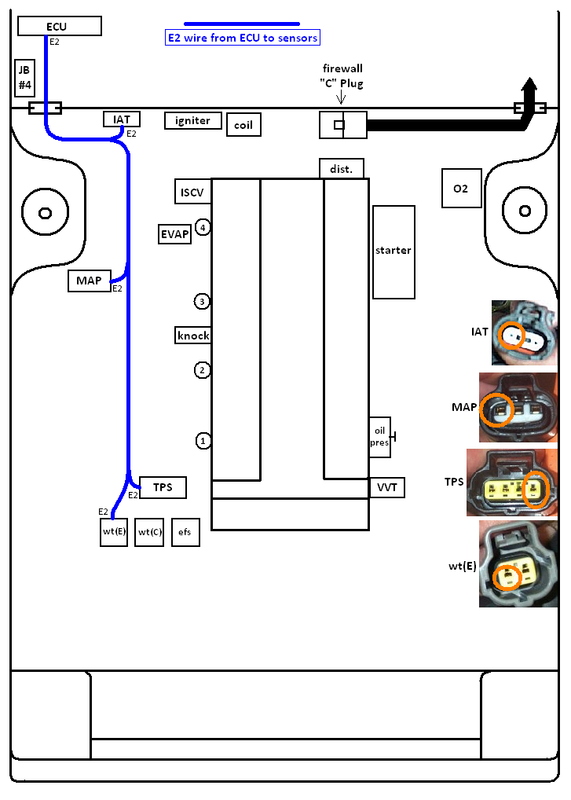 updated to include a "connector de-pinning guide"
Again, thank you. This helps a ton at fixing wiring issues. So after reading the 22 page COP thread, I have a question with your setup or anyone else running COPs. Did you ground the thick red ignition wire that comes off the coil to the dizzy or did you just insulate the **** out of it and let it arc until it dies? Are you having tach issues? I'm looking for what the final most reliable outcome was and if it's worth doing. I removed the wire, stuck some small cap plugs into the coil, a larger one over the whole coil output post with a ziptie. no problems with it burning out, no problems with the tach. you need to keep the oem 20v igniter to run the tach. 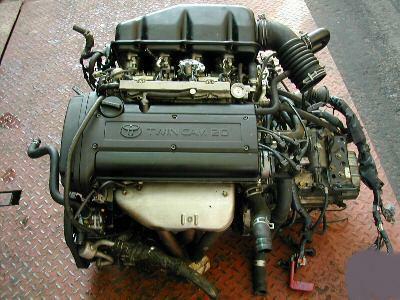 I'm also doing a 20V swap and this topic is basically what i need. Keep the pcitures and details comming man. Hi Morgan. Thanx for the write-up. It helped me so much. Thanx to you there are a lot of 20v running out there. just like you break it down for the 20v will be a blessing. Thanx again. So much. Keep up the good work. From MD. 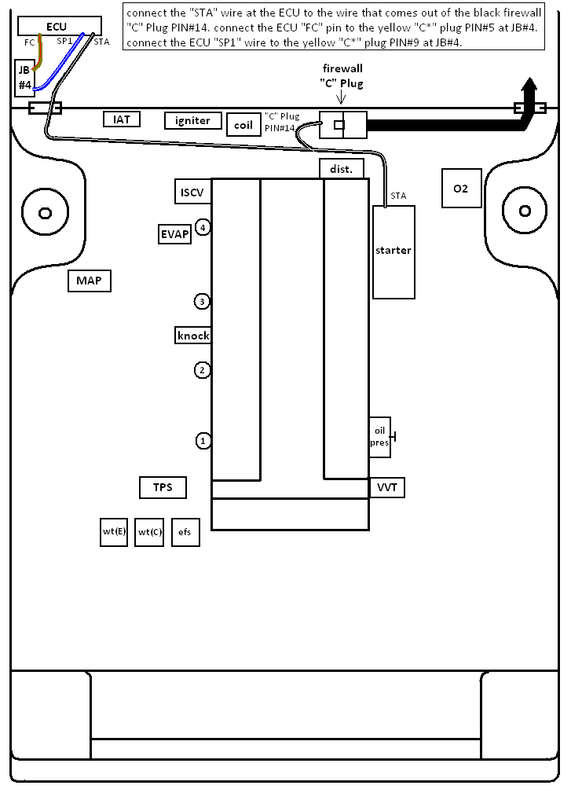 EFS is the Electric Fan Switch, the white single wire sensor on the 20v backing plate with the thermostat in it. I used it to run an electric fan with a relay. 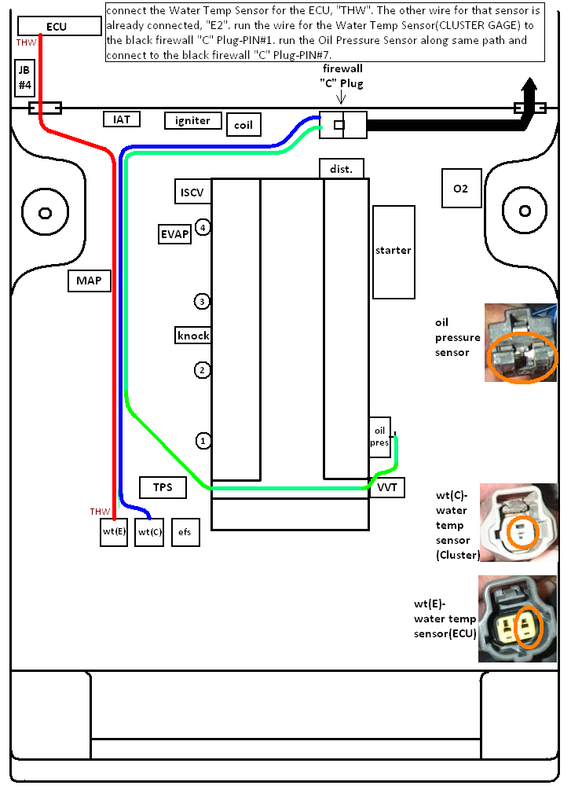 its been a while since I did that but the FSM will explain how the sensor works, regarding temp and its signal, or you can try searching for the DIY I did on that which might be on the old board archives. its rather easy to do. as for the alternator, I never wired one up, since the ae86 has the alternator wiring in the headlight harness and not the engine harness, so I didn't have to touch a thing. in terms of what wires what, I might be able to provide that. Probably a stupid question buuuuut I want to clarify something that's been bugging me about this swap. 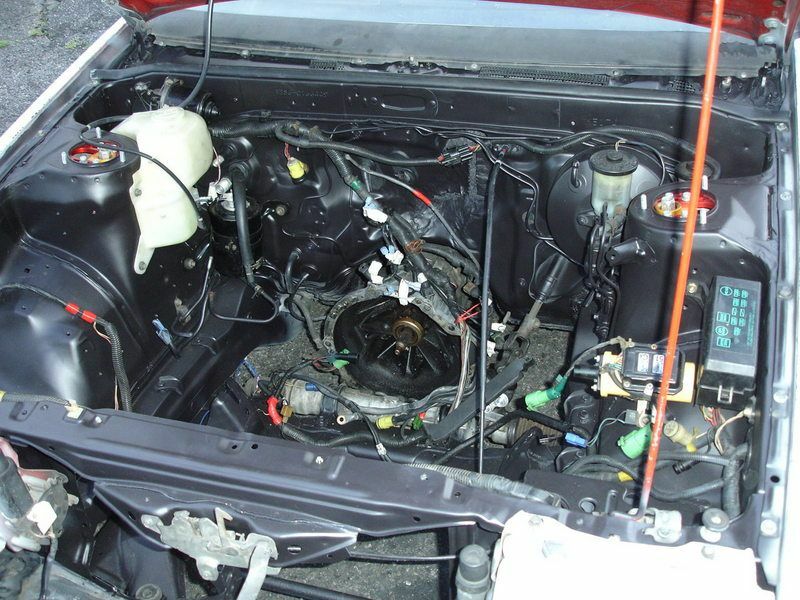 For someone with an SR5, can someone wire the engine harness' so that you don't have to rewire the whole damn car? hachirokufan wrote: Probably a stupid question buuuuut I want to clarify something that's been bugging me about this swap. 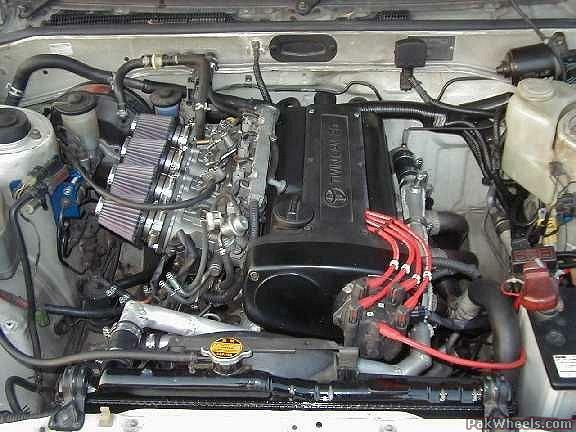 For someone with an SR5, can someone wire the engine harness' so that you don't have to rewire the whole damn car? wires for a fuel pump going to the back as well as under-dash. my question, with this wright up can i buy a silver top and run it on the map sensor with open stacks?